2012 saw a sharp increase in net company growth in Huddersfield, West Yorkshire according to the latest Duport Business Confidence Report. Our latest report contains some very positive figures for the Huddersfield region. A new report from company formation specialists, Duport.co.uk shows that there was a significant rise in net company growth in Huddersfield last year. Between January and December, the company register increased by 504, compared to 394 in 2011. Net company growth in Huddersfield has been increasing steadily since 2009, suggesting that the town is gradually recovering from the worst effects of the recession. In further good news for the area, the Duport report shows that 2012 was a record year for company formation. There were 1187 new companies formed - more than any year on record for Huddersfield and an 8% increase on the previous year. Huddersfield has one of the largest economies within the Leeds City Region, yet the cost of business premises remains relatively low, making it a desirable area for new companies to start up. 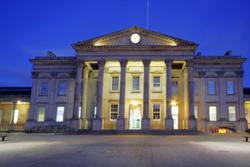 “Our latest report contains some very positive figures for the Huddersfield region. The Duport Business Confidence Report for Huddersfield contains a variety of data that can be used to form a snapshot of the local business landscape. More information and statistics can be found at http://www.duport.co.uk/huddersfield.